The 6th Annual Qatar Red Crescent Disaster Management Camp (QRC DMC) successfully united over 300 participants for 10 days of intense practical training. My compliments to the Qatar Red Crescent staff, International Federation of Red Crescent and Red Cross, other trainers/guest speakers and participants for a very professional and often all too realistic training camp. On behalf of Dr. Sofiane Abbar, Dr. Sarah Vieweg and our team, thank you for including Qatar Computing Research Institute in your event. 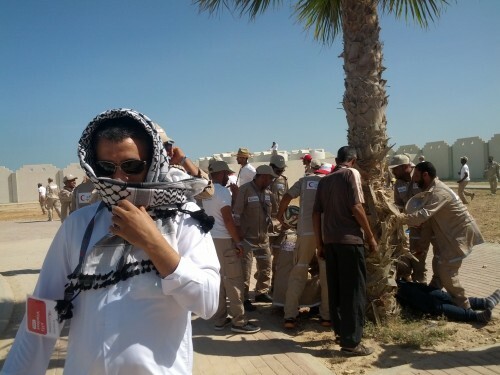 Participants at the DMC included Qatar Red Crescent Staff, staff of other Red Crescent societies, the Qatar EMS, Qatar Civic Defense, other official entities and volunteers. A portion of the participants were divided into training teams designated by colour code. These groups received training across various humanitarian and emergency scenarios including water and sanitation, shelter, food and nutrition, search and rescue, medical response and communications.Participants were responsible for the activity from their training track for the remainder of the day. The Social Media and New Technology class taught by my co-host, Ali El-Sebai El-Gamal (Qatar Red Crescent), and I held a one hour training for 6 days with 6 different teams. Before and after class, I created online communications, attended scenarios, joined classes and other camp activities. Every day people talked with me about the potential of Digital Humanitarian skills, Qatar Computing Research Institute’s work and best practices of social media during emergencies. So, if students attended the Media and Communications track, they were then responsible for all camp communications for the day (as with all the other tracks.) The Media and Communications track included media handling, communications methods, GPS, Satellite phones, radios and social media. We observed social media and communications training translate practical communications activities during the scenarios. The methodology of learn by doing provided students with a richer experience. The communications teams used their social savvy to practice online verification and human computing (harnessing ‘your network’), they live-tweeted events, crushed rumours and held press conferences with Twitter. They used WhatsApp to relay critical information during scenarios between two emergency sites, thus having the medical center receive updates via radio, phone and a WhatsApp messaging group. Pictures were also sent via WhatsApp by the response team to medical team to help them prepare. 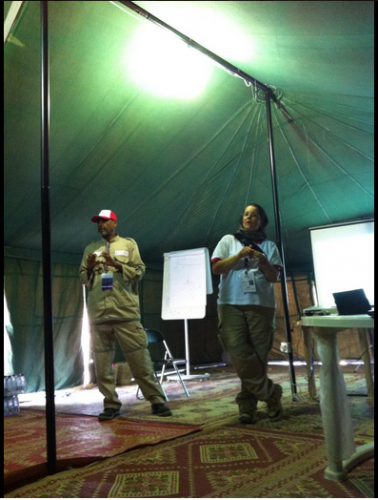 See our updated Storify (aggregation of social media) of the Qatar Red Crescent Disaster Management Camp. While the photos include smiling faces, note that we often delayed or obscured social content during some difficult scenarios. After all, the purpose of the camp is not only about communications and storytelling. Some of the participants have previously participated in humanitarian response. Some of the new trainees will be trained more and deployed. 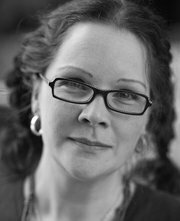 On the last day of the QRC DMC, I watched faces of participants and staff knowing full well that they may experience the best and worst of humanity. The teaching moments abound as I consider how to apply this experience to our work at Qatar Computing Research Institute. I have some ideas based on the feedback from staff and participants. Stay tuned on the implementation after I do some reflection and consultation. Often the scenarios and conversations resulted in participants and staff highlighting ethical issues around these communications tactics. It was fantastic to hear people question issues around social media from privacy, security, access, trusted sources and the best practices. As humanitarians, they will face a wide range of issues so training instincts and debating tools/tactics is so important. The reality is that within a camp such as this it is possible to see just how pervasive new media may be during some emergencies. It is true though that this adds a complexity to their already difficult work. But the point of highlighting these tools and techniques is really training for “IF” social media and messaging becomes a factor in their real field work. Every day I collected a straw poll (informal survey) in my class. I asked people about their use of social media and new technology. Sometimes there were people missing from the groups due to meetings, so the numbers are not exact. However, this gives you a window into the DMC’s community technology use. Thanks to Infogram for the tools to tell this data story. How to use: click on the radio buttons to see the data by group and by type of social media/technology tool. (Photo 1: Said Tijani, Qatar Red Crescent, at the QRCDMC April 3, 2015 scenario, credit: Heather Leson CCBY; Photo 2: Suma (QRC) at the QRCDMC April 7, 2015 scenario).